9 things to expect from the new Dynaudio | What Hi-Fi? Dynaudio has big plans for the future, following a takeover that has brought fresh investment and management changes. We travelled to Denmark to find out more. A year ago this month, Dynaudio was acquired by GoerTek, a large Chinese electronics company specialising in electro-acoustic components. "Dynaudio 2.0" was promised, bringing with it new technologies and new products, with the aim to deliver "the world's best sound systems for studios, home and car". The investment and hiring spree that followed seemed to support the fact that Dynaudio had big plans. Sure enough, the following 12 months saw the company release a typically diverse range of products. We've seen new digital active desktop speakers in the shape of the Excite X14A, a new Contour LE range of floorstanding speakers, and we've also taken the company's latest in-car audio system for a spin, the Confidence system for the VW Passat. 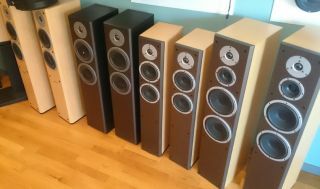 All built around the company's speaker drivers, which are designed and built (almost entirely by hand) at the company's headquarters in Skanderborg, Denmark. Drivers of which Dynaudio is understandably very proud. Dynaudio has always been a high-end hi-fi brand - and it's not looking to give over any of that market any time soon. Speakers such as the £12k Confidence C2 Signature will continue to take pride of place at Dynaudio HQ. Core technologies such as coated soft dome tweeters, die-cast aluminium baskets for the drivers and furniture-grade cabinets, will continue, Dynaudio hopes, to keep the company competitive when it comes to aspirational speakers. That's not to say there isn't room for improvement, with plans for industrial design research to improve the standard box design, for example. "A little more modern, a little more interesting," as Pederson puts it. But high-end Dynaudio hi-fi products are here to stay. That said, Dynaudio is definitely looking to expand its offering. This means both new product categories and more affordable products, together helping the company to reach a larger audience. "Not just high-end" was applied to in-car audio and home speakers. We suggested a smaller, more affordable Xeo active speaker to sit beneath the Xeo 3... but Team Dynaudio remained tight-lipped. But it's clear the expansion of existing lines, to allow for a fuller, more affordable product range, is on the agenda. So watch this space. Amplifiers are on Dynaudio's to-do list, with in-car audio the, excuse the pun, driving force here. At the moment, Dynaudio makes hundreds of thousands of speaker drivers for car sound systems every year, but not a single head unit. Instead, it's forced to work with the unit it's given. The company then adds its own digital signal processing (DSP) and the general audio tuning of the system. As Pedersen says, "Today we supply the drivers, somebody else supplies the electronics... that means someone else has told us which knobs we can turn." Clearly, Dynaudio wants to turn all the knobs. The company is investing in R&D in a big way to become a complete in-car audio system supplier. But it needn't just be in-car amplifiers, the build of its amplifiers for existing Dynaudio active speakers (which are designed by Dynaudio but built elsewhere) could also be brought in-house. "Dynaudio headphones is a possibility in the future... why not? We're very good at drivers and a headphone is basically a driver and something to hold it in place. That's more or less a headphone, why shouldn't we make such a thing?" said Pedersen. The company said it was acutely aware of the competitiveness of the headphone market, so would only enter with a top-class product that could make a difference in the market. We shall see. Dynaudio has big plans for DSP in the home and for cars. Pedersen has worked in room correction for 25 years, previously at B&O, and believes it's an area in which there are plenty of improvements to be made that can improve the end user experience. "If you don't know the room, you don't know half the story," he says. "This means a big risk of dissatisfaction for customers. But it can be cured, in a sophisticated way." Dynaudio is adamant one mic in one listening position simply isn't enough and is working on ways to take more measurements to improve the soundfield. One of the most interesting parts of DSP touched on briefly by Dynaudio during our visit was the company's efforts to control multiple audio sources from one speaker. This could theoretically allow two people to sit side-by-side in the same living-room and listen to two different things. One could be listening to the radio, one could be watching TV. Or you could have two screens served by one soundbar-style speaker. Early days but an interesting concept, and a rough prototype gave a glimpse of how it could work. "Adding height information... it's coming and we're ready, both in the car and the home," that's the verdict on what Dynaudio calls 3D Audio. So height channel speakers, such as those we've seen from Klipsch, seem to be on the roadmap. Does this mean embracing Dolby Atmos and DTS:X? "We follow all of them... And yes, for [in-car] it also makes sense. Anything that can enhance the apparent ceiling is of real value to the end customer." ...the focus on in-car audio was striking, little wonder when it represents around 50% of Dynaudio's business. Yes the home (40%) and pro (10%) markets will remain every bit as important, as Dynaudio was keen to stress, but it's likely a lot of R&D spend will be going on in-car technology. As well as focusing on the company's first amplifier in order to take control of in-car electronics, and the more futuristic tech such as noise-cancelling cars, the main push looks to be bringing better quality car audio to more people. As Pedersen put it, "Very good sound for all people, not just high-end cars." Dynaudio is happy dealing exclusively with the Volkswagen Group - it's a big group - but it looks like it will aiming to get more of its drivers in more of the company's cars. Not just premium models. Clearly the last 12 months has seen plenty of change for Dynaudio. A takeover and new investment seems to have given the company a fresh lease of life, as it hires more staff, expands its headquarters and looks to move into new product categories and price points.